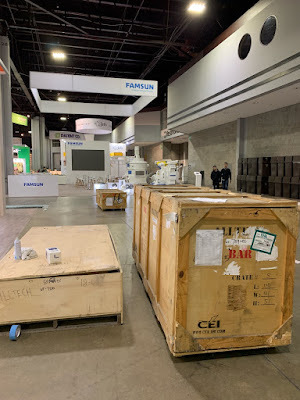 The 2019 International Production & Processing Expo (IPPE) has surpassed 600,000 square feet of exhibit space and has secured more than 1,415 exhibitors. IPPE will run from Tuesday 12th – Thursday 14th and the Milling and Grain team are in attendance to keep you up to date. "Ninety-nine percent of the show floor has been booked. With all three halls of the Georgia World Congress Centre covered in exhibits, this is going to be an exciting show that you will not want to miss," commented IPPE show organisers. IPPE is sponsored by the US Poultry & Egg Association (USPOULTRY), the American Feed Industry Association (AFIA) and the North American Meat Institute (NAMI). The 2019 IPPE will provide attendees with a full week of education programs, innovative technology, engaging activities on the show floor and enhanced networking opportunities with key leaders from the animal food, meat and poultry industries. The vast trade show floor will showcase the latest technology, equipment and services used in the production and processing of animal food, meat and poultry products. Combining the expertise from AFIA, NAMI and USPOULTRY, IPPE will also feature more than 200 hours of dynamic education sessions focused on current industry issues. Follow the Milling and Grain Twitter feed for updates, HERE. For more information on IPPE, visit the show website, HERE.